In this update we bring you rim and tambourine as an addition to basic drum set. Drum Kit is a virtual set of drums with full range components. It includes sampled sounds of a variety of drums, cymbals, a tom and a kick drum – 16 drums in all, and all on screen at the same time. You can arrange your set as you wish. All of the drum components are movable so if you are for example, a left-handed there is no problem. Just unlock DrumKit and arrange it as you wish. Pretty cool, isn’t it? 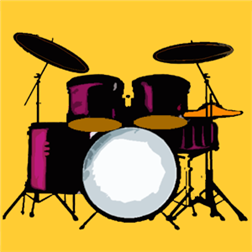 Drum Kit supports multi-touch and enables you to play most popular beats. In future upgrades, you can expect many features. One of planned is sound recording feature so be in touch!